i am still playing catch up. all of these comic cons are running into one gigantic never-ending con season. not that i'm complaining so much. i just have been rather stressed about preparations and traveling accommodations and money (oh boy, the money) that i can barely blink. 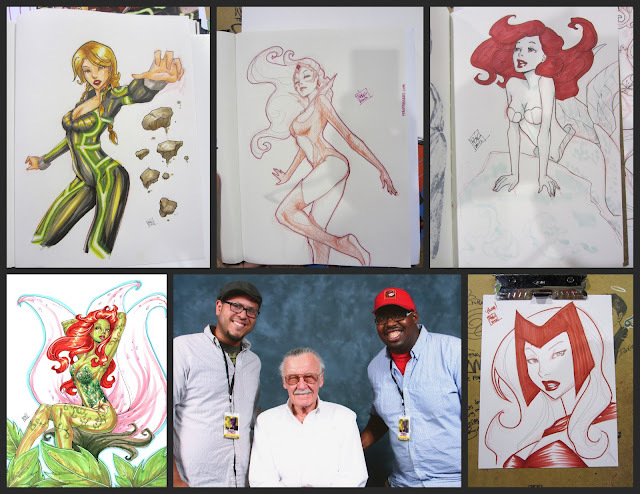 so i just wanted to make sure i shared these pics from the 2 most recent comic shows we've attended since Wizard World Philly (which seems like years ago now). first up, this is a commission i did for a great repeat client at the Southern Maryland Comic Con in Waldorf, MD just this past saturday 7/7. small as the convention was, and even though we were inside of a hockey rink (i know, it sounds weird, but it wasn't bad), we really enjoyed our time there and the folks we saw were all so great and fun. had a great time sitting next to Matt Slay - fantastic artist and all around cool dude. anyways, back to the commission. this client gave me the very first page of his new book and that is all the way daunting. but he gave me freedom over who to draw so i HAD to draw my fav X-person in my fav costume for her. YAYS for Rogue! btw, i can't tell u how much i HEART my white gel pen. where has it been all my life?!?! 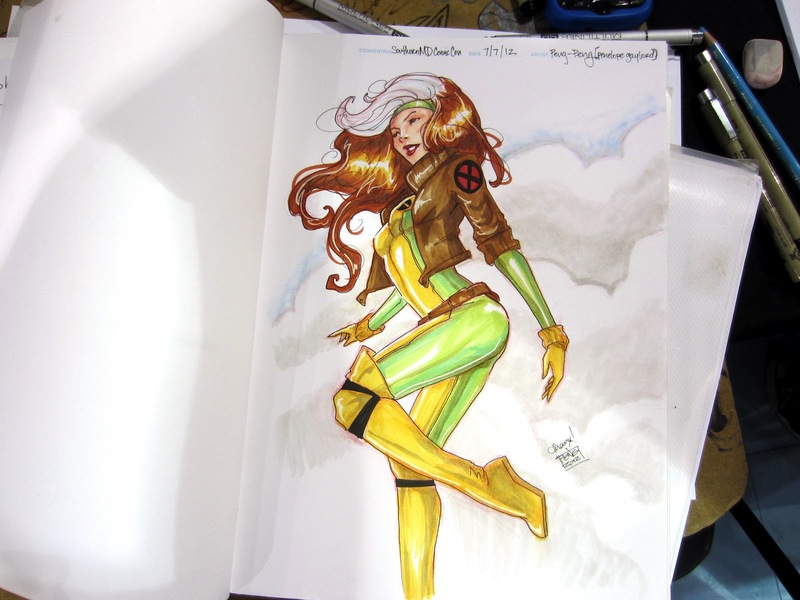 these are pics of commissions and free sketches i did at Heroes Con this year. i was actually allowed to take home the Poison Ivy commission to finish it up and mail so i gave it a little extra love. but the piece de resistance is the picture that my studiomates took with Stan "the Man" Lee! i didn't get to be in it because someone had to stay behind at the table to watch it but this was good enough for me. i think it meant more to them anyway.